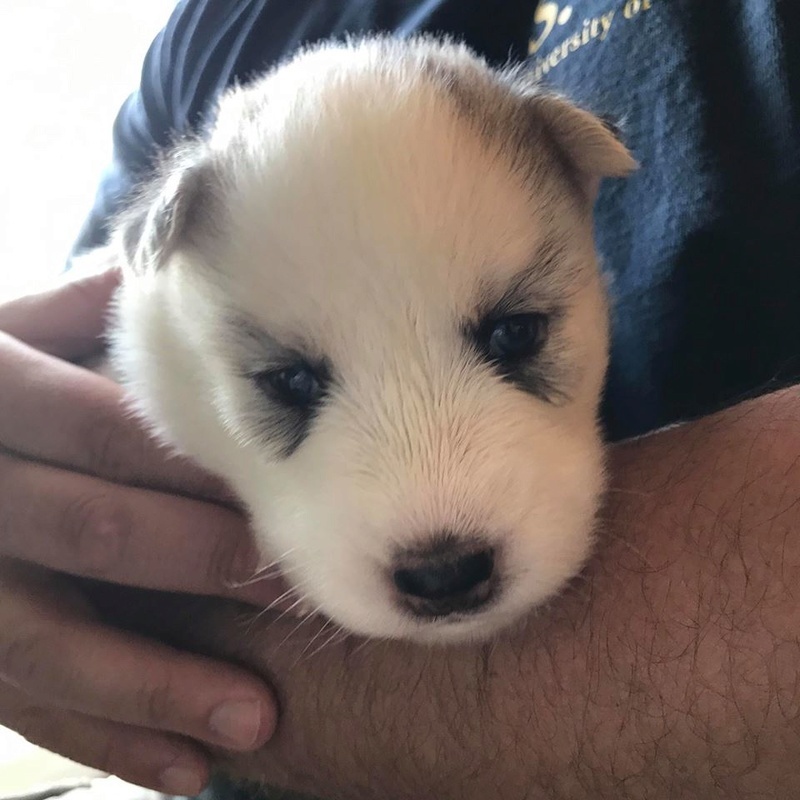 I have never been much of a forum person but with my first Husky coming to me as a 9 week old puppy on June 24th I'm excited, nervous...but above all else I'd like to be prepared. - Puppy food, Acana Wild Atlantic, but I also thought about getting fish meat from my local pet store to mix with it. - I bought a few brushes, one of them being a double sided rake and shedding brush and then just a regular brush. - A water bowl that has a filter and constantly circulates water around. Background: She is coming into a home with Me, my wife, two children (8 and 9), and two maltese/yorkie dogs. The smaller dogs, while they listen pretty well they have a few bad habits of having accidents if left alone and not in their kennel. I definitely don't want the puppy picking up and of those bad habits. So, this is where I am... waiting for my new puppy and trying to make sure that I do right by her. If anyone has any advice AT ALL I'd love to hear it. Please be as critical as you feel is necessary based on your experience. While I'm sure every Husky is different there must be some things that we can do to make this an incredible transition for her, from her old pack to her new one. Hey JR, welcome to the forum. What is that piece of fluf you have in the picture with you - it can't be a Husky? << teasing >> my guess is that (s)he's about 4-5 weeks old there, yes?? 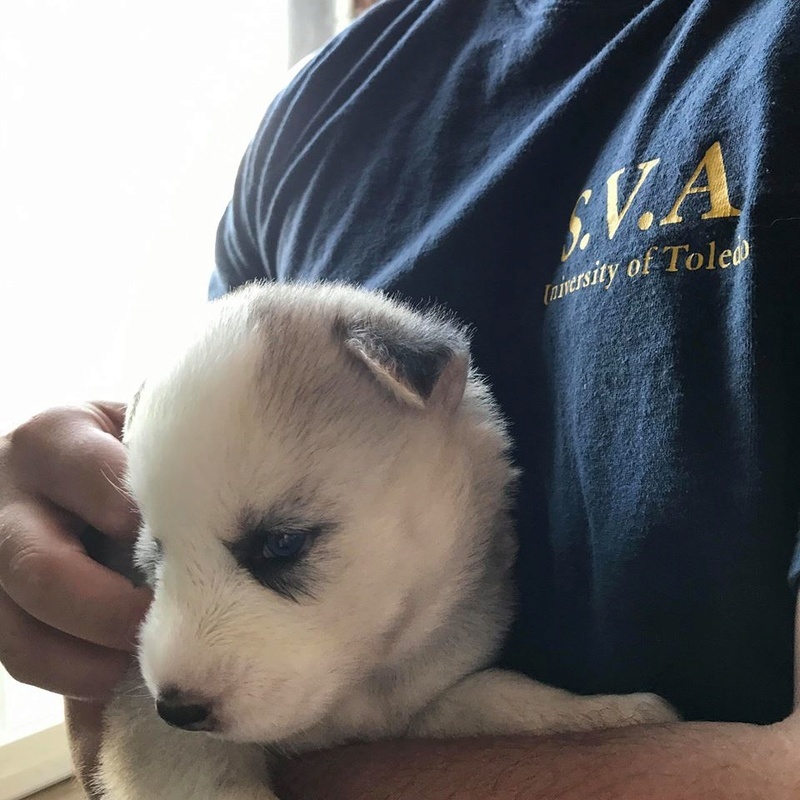 Since you already have two dogs (if I can call them that, I'm not much on small dogs) I bet you think you're ready for a Husky. Think again, everything you thought you knew about a dog is going to go out the window when you finally get him/her (which is it? sorry you do eventually say "her") home. They're a delight, they're a terror, they're the devil incarnate if allowed to be! Translate for me please - alcyoné, I presume that's the English word halcyon but as a name "a time of peace" doesn't make sense to me? Puppy isn't allowed on the furniture - you'll appreciate that the first time he blows his coat! Husky's have hair! Plenty of hair, too much hair and you'll find it in everything! Puppy must stay on the floor. As a puppy it's fun to pick up and cuddle, as a 50+ pund dog who expects to be treated as a lap dog, it's not as much fun. You get on the floor to play with the puppy not vice versa. No human food. It does two things, spoils the puppy who will expect 'samples' from peoples plates and can be bad since you can't accurately judge how much he's eating. 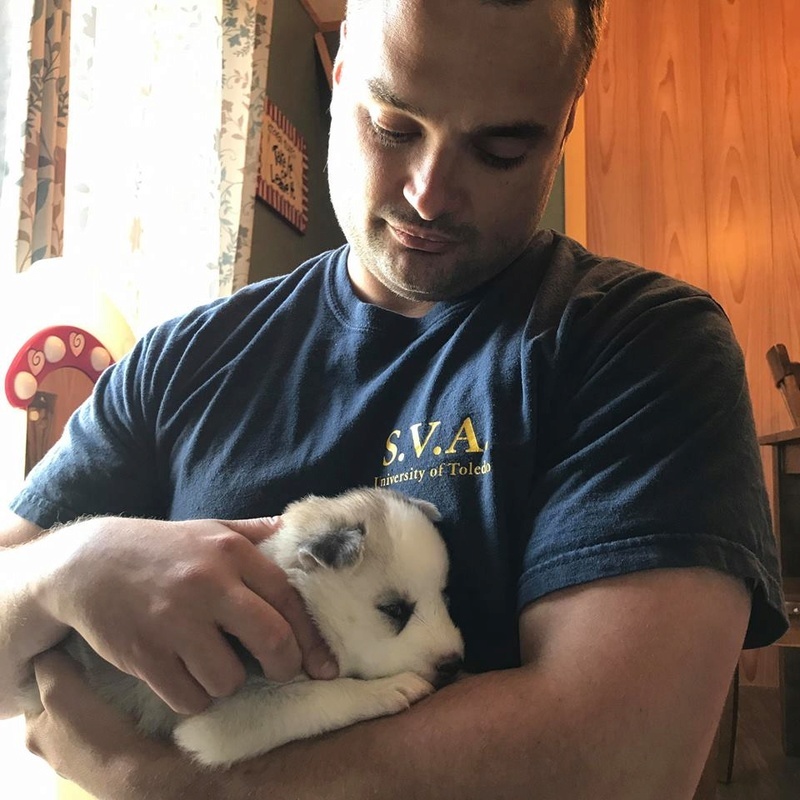 Obviously my suggestions are somewhat tongue in cheek - but my line that you should "Raise the puppy you have now to become the dog you want it to be." is quite serious. I'm not sure how big your existing two pups are but I'd have a leash on everyone (maybe even the kids?) when you introduce the dogs. Adult dogs normally recognize a puppy as a puppy but it's always better to be safe than sorry. We look forward to pictures of all when you have time - even though I'm not a picture freak, we do appreciate seeing what you have. Al pretty much covered the main things. You seem to have the stuff you need. Make sure there's chew toys around. I will make mention of the vest. Puppy should not carry any weight until a year old. At a year you can start carrying an empty vest and very slowly work up to carrying a little weight. I believe the rule of thumb for pets is not to carry more than 10% of their body weight in a vest or backpack. I say pets because proven sled dogs who have been conditioned and structurally checked can carry more. Most pets haven't had those kinds of conditioning or medical checks though so doing more weight could injure them. She's very cute in your avatar. Can't wait to see more pictures. him welcome to the forums. Thank you everyone and Al, I love your humor! First her name since you asked Al. Alcyone (we will probably just call her cyone) is the name of one of the seven sisters. Let me explain: She was born April 29th, the same day as me and our zodiac sign is the Taurus. Within the Taurus constellation there are seven very bright stars in a cluster. These, were called the "seven Sisters." From as far back as we know, these stars are mentioned in various ways. However, every "sister" has a name. I'm not sure actually if they are the real names of the stars or if they were from Greek mythology but one of the sisters was named Alcyone. So on her papers her name is Alcyone Star Miazga. Fun fact, the seven sisters was the first known eye test. Since these were the seven brightest stars in the sky, if you could see all of them then you would be a scout maybe. As far as guidelines, I haven't set any yet other than the fact that Alcyone does not sleep on anyone's bed or in anyone's room. This rule also applies to our little yappers (the dogs not the kids,haha). It WILL be hard to sell everyone on the idea that the little yappers CAN get on the couch but Alcyone can't. Hmmm... and we don't allow our yappers to eat "people" food so that will be easy. We will leash everyone (hahaha, luckily the kids listen pretty well, I'll refrain from leashing them for now) for the introduction so they can all meet. The other two dogs (yappers) are about 8lbs if they're wet. Twister, I was going to take Cyone to the pet store to have her tell me what she likes instead of spending money on what she doesn't. My yappers aren't really particular but they destroy every toy they have ever gotten to nothing. They can't even sleep on a doggy bed or blanket since they just rip it up. Anyway, I will give Cyone a toy she can play with in here kennel and eventually I am guessing her toys will be big enough the yappers won't want to destroy them. I will try to find some pictures and post them now. If I post them incorrectly, I think there is a thread about this just please correct me, I'll take no offense. Thanks for the advice everyone, we will put your words into play. Your experience combined with a little research should prove to be beneficial to this new pup and our resulting home. Now I'm just being nosy. SVA - what branch, I put in almost 10 years in the Army Security Agency around the time of Viet Nam. Did tours in Viet Nam, Korea and Japan ... came home and I could eat better with chopsticks than I could with a knife and fork. Oh and of course I'd have recognized her name if you pronounced it correctly - Alkyoné, that's Greek and should have been a hard "c" (and I'm so full of it my eyes should be brown!) Then in good military fashion you could have called her "Alky"
As a note, taking a puppy who hasn't had all their shots to places like a pet store is *NOT* a good idea. Ideally all the dogs going into the store should be current on all their shots but it only takes one carrying a bug for you to have a *very* sick puppy. Looking forward to seeing more of you all as you await her arrival and then, of course, after. You sound well prepared and it sounds like you've done your research. One thing stood out to me though. The military dog vest and the plans to go hiking this fall. I'd personally advise not to do that (hiking is fine, the backpack portion is what I have concerns about). You want to wait until the dog is fully grown before dealing with any added weight. Having a dog start this sort of physical behavior (pulling/carrying) prior to that can cause bone/muscle/growth/joint issues. For a Husky, I'd wait till they were a year old before doing any weight. So you'd be looking at next May then. It's a long wait, and that's hard to do, but when you consider the long term health benefits of waiting a little longer, it's worth it. aljones - I was in the US Navy for four years and then the US Air Force Reserves for another 12 years. As far as eating with chopsticks, I too always jump at the chance to use them. Hahahaha, as far as her name, I DID pronounce it correctly enough. lol. It could be AL-SIGH-AH-KNEE but that isn't as much fun. and thanks for the advice on the pet store. Welcome fellow Ohioan! (I am by Cincy!) Good research good advice. One more grooming suggestion, nail clippers....start early and continue from the start throughout life. It helps train and condition that this is okay to have your paws handled and claws trimmed. Take a little just to train them. Remember that training is mental stimulation and it can be as helpful as physical exercise. At a minimum I think it is five minutes of exercise per month of age up to twice a day. Taking your puppy on a nice short walk or letting him play in the yard translates to a calmer canine that will more than likely sleep very well that night. The mental stimulation can be a great socialization, training, and bonding exercises for you and the whole family. Remember to build up to every activity short walk to long hike, short run to marathon, carrying empty items to weighted, pulling empty items to pulling /running attached to human loaded items (Sled/ scooter, roller blades) as you build up to the event the age is built up too so bonus. Yes high endurance is a thing for an older dog so that you do not damage the musculature and skeleton. Each dog is different these are generalizations only. We belong to a dog get together group, and do lots with them and on our own....dog parks, dog events, dog playdates, walks, 5ks, scootering, and bikjoring. Each of my dogs had to work up to these! 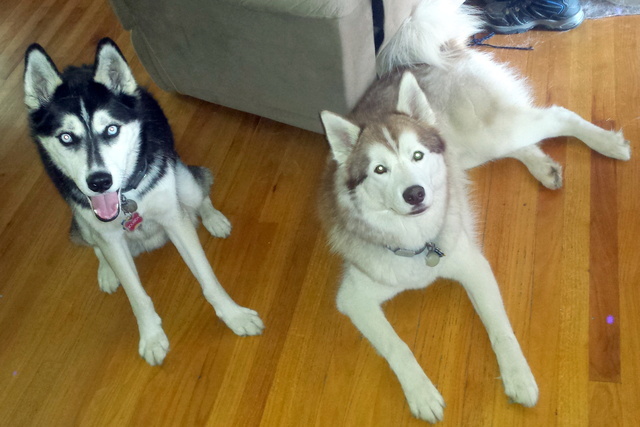 They love them all and I believe they help keep them socialized stimulated and exercised. Oops gotta run! Welcome again!